If you have sweet potato haters in your midst, make these cookies. Just don’t tell them what’s inside until after they take a bite. 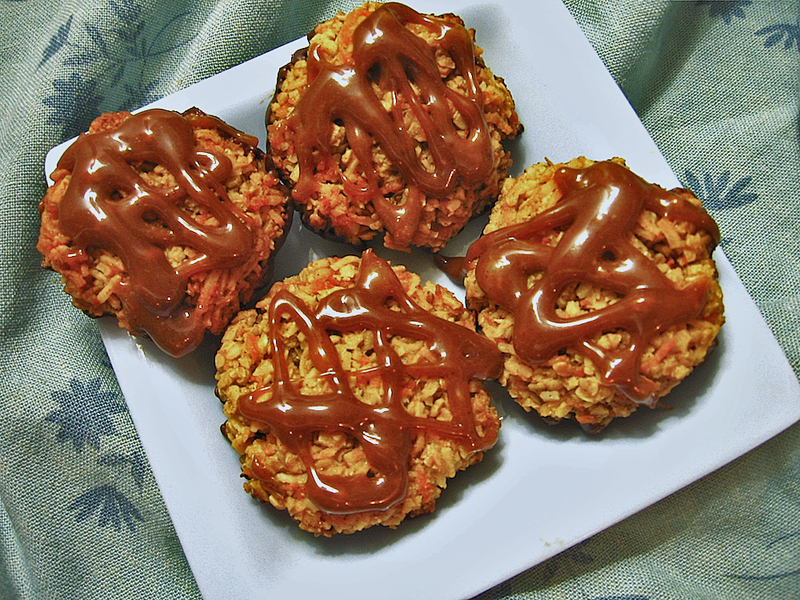 The joke’s on them, because they’ll want to keep eating these chocolate-dipped coconut cookies with caramel topping no matter what you say. When it comes to boxed cookies, I thought my days of indulging in Girl Scout cookies were over as soon as I moved to Canada. However, recipes for homemade versions of those famous cookies continue to infiltrate my Pinterest feed. And many of the new recipes (like these Samoa bars from Life Made Sweeter) look even better than the original cookies that inspired them. I got to taste genuine Samoas from a box again about a year ago. After all the anticipation, I was disappointed. It didn’t seem as tasty as I remembered. So I thought I should try out my own gluten-free version, and see if homemade cookies really could taste better. To make these cookies healthier, I included a genuine superfood–sweet potatoes. 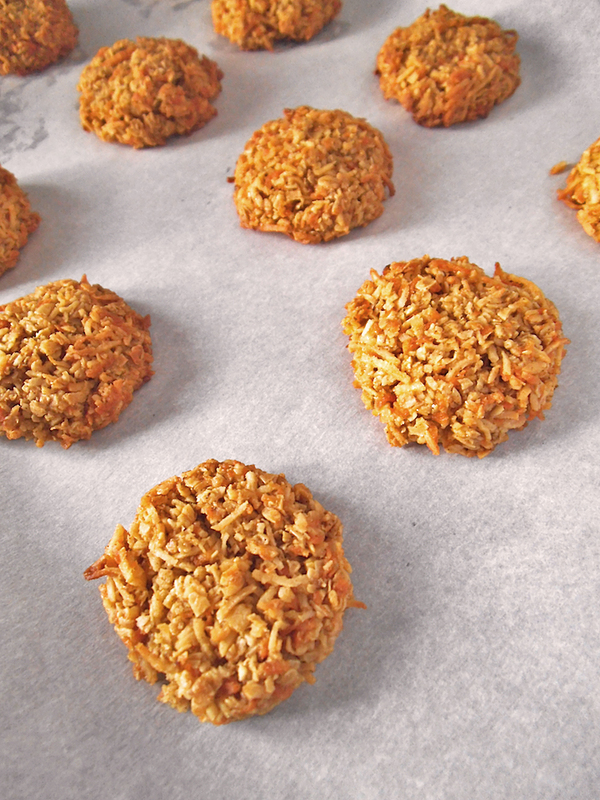 Though it’s not a typical cookie ingredient, the sweet potato complements the oats and coconut beautifully. A touch of cinnamon ties it all together. And even before adding chocolate and caramel, these cookies are crave-worthy. As you can imagine, coconut cookies smell incredible while they’re baking in the oven. So save your scented candles for another day and bake these low-guilt cookies. Heavenly aromas will waft through your kitchen and into the corridors of your house. You will eagerly anticipate the delicious toasted coconut and oat goodness. That first bite will confirm that these caramel-drizzled cookies are absolutely worth making at home. Will you like them better than the original boxed cookies? There is but one way to find out. Or maybe there’s more than one, since the caramel and chocolate can be customized to your liking. My preferred version of these coconut cookies is actually with extra caramel and without the chocolate dip. But I am a little unusual in my take-it-or-leave-it attitude toward chocolate. Perhaps you consider chocolate a necessary component. If so, by all means, dip and enjoy! To make cookies, in a medium mixing bowl, whisk together coconut oil or butter, salt, egg whites, and sugar. Add oats, coconut, sweet potato, tapioca/cornstarch, and ground cinnamon and mix well. Preheat oven to 325 degrees F (170 C). Scoop heaping tablespoons of dough, roll dough into balls, and place onto parchment-lined baking sheets. Flatten each cookie with your hand or a fork. Bake for 15 minutes, until tops of cookies turn golden brown and crisp. If cookies seem too soft, turn up heat to 350 degrees F (180 C) and bake for 5 to 7 minutes longer. Remove trays from oven and let cookies cool on warm baking sheets for 10 minutes. Transfer cookies to cooling racks. Melt chocolate chips with coconut oil in a small saucepan over low heat, stirring constantly. Or microwave the chocolate and oil in 30-second increments, stirring each time, until just melted. Dip the bottom of each cooled cookie into melted chocolate. Place onto a tray or flat plate lined with greased baking parchment and chill until chocolate hardens. To make the caramel sauce, combine almond butter, sugar, salt, honey, and maple syrup in a small sauce pan. Heat over medium low heat and stir frequently. Turn off heat and stir in vanilla. Gradually add and stir in almond milk by teaspoons until the caramel reaches drizzling consistency. Let cool slightly. Drizzle caramel over cooled cookies. Caramel can be gently reheated and/or thinned further as needed. Serve cookies after caramel has cooled completely. I share recipes at Allergy Free Wednesday, Gluten Free Wednesdays, and here. I’m also sharing this at Natural Family Friday and Savoring Saturdays. These look fantastic! I never would have thought to use sweet potatoes – how ingenious! Thanks for sharing your recipe at the Inspiration Spotlight party! Pinned & sharing. Hope to see you again soon! These sound amazing! I love that there are sweet potatoes in here. Great way to sneak in something so nutrient dense. Pinned so I can try these out on my family. I have a sneaking feeling they’re going to love them. Only one word for these: YUM! Featuring these tempting little morsels this week! These cookies look absolutely incredible, Julia! 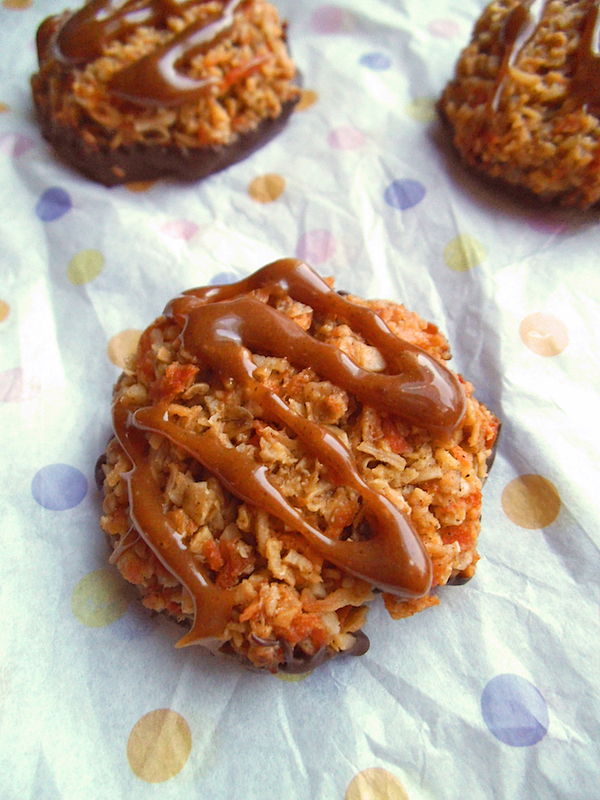 Samoa cookies are my favorite and I love that you made them healthier! Making them with sweet potatoes is such an incredible idea! Can’t wait to try them! Thanks, Raia! I may have finished the batch on Monday, but I can’t get them out of my head. Enjoy! I don’t see any mention of the egg whites or the tapioca flour/cornstarch in the directions. When do you add these? They look delicious! Oops! I’ll add that to the directions shortly. I had to add the tapioca later to balance out the moisture. Delicious and healthy, love it! Great blog, btw, glad I came across it! Um YUM!!!! I really want to make these! Sweet potatoes? Who would have thought! Definitely pinning this for later! Your samoa coconut cookies recipe will not print. I have no problem printing recipes from other websites. Very frustrating. I am sorry it is not printing. 😦 I often print recipes from my site, but this particular post seems to have an error, which I will work to fix shortly. I was able to print it just now. Perhaps there was a temporary glitch somewhere. Will want to try this recipe for sure.